Fame Academy winner Alex Parks' debut single has hit the charts at number three. 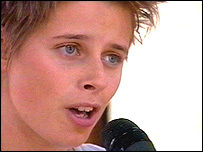 The Cornish teenager's song, Maybe That's What It Takes, was beaten to top spot by cover versions from Westlife and Girls Aloud. Alex, 19, was in Truro on Sunday afternoon to promote the release of her debut album Introduction. More than 400 fans turned up at the HMV store in the city as Alex started her UK tour of record stores. Alex's father, Stephen Parks, said he was overwhelmed by the support for his daughter. "I knew she had a few fans, but the turn-out in Truro was amazing," he said. "I was quite surprised to see so many people. We had to force our way through the crowd to get in the door of the store. It was really quite weird." Alex, from Mount Hawke, won the BBC's Fame Academy last month, receiving a £1m record contract, a London flat and a sports car. Her new single was written while she was in the academy. Westlife secured their 11th number one with Mandy, with Girls Aloud's Jump (For Your Love) in second spot.